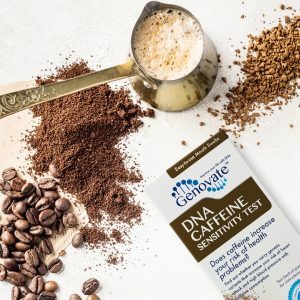 Home Lifestyle Food Sensitivities Did you know DNA influences your response to alcohol? Albert and his best friend Warren arrive at their first college party, excited and ready to celebrate. They grab a drink and head into the already crowded room. Ten minutes after finishing his first drink, Albert feels sweaty and flushed. By 10pm, just two hours and three drinks later, Albert is frantically looking for Warren. Now he’s sure something is wrong. He’s itchy all over his face, arms and back. A very worried Warren calls 9-1-1. This was the day Albert discovered he suffers from alcohol flush. Alcohol flush is one symptom of alcohol intolerance, when the body can’t break down alcohol properly. Other symptoms include nausea, dizziness, headaches, increased heart rate, insomnia, and severe hangovers. Unfortunately, or fortunately, depending on how you feel about social drinking, alcohol intolerance is inherited. Anyone who has had a drink knows the buzz usually wears off, as the body breaks down the alcohol. There are many different ways to clear alcohol. 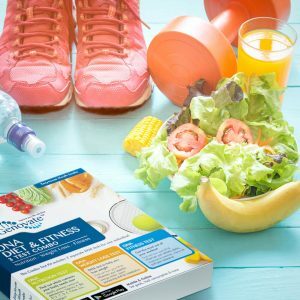 However, most of it is metabolized in a two-step process involving two enzymes, alcohol dehydrogenase (ADH) and aldehyde dehydrogenase (ALDH). ADH converts ethanol to acetaldehyde, which is then converted into acetate by ALDH. Acetate is similar to vinegar and is harmless. Acetaldehyde on the other hand, is toxic. The buildup of acetaldehyde, which is normally short-lived, is responsible for all of the symptoms associated with alcohol intolerance. 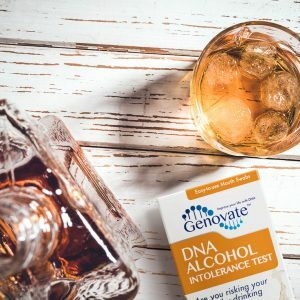 People with alcohol intolerance carry variants in genes that give instructions to make ADH and ALDH. Genetic variants are different versions of the same gene that exist between people due to small changes in DNA. 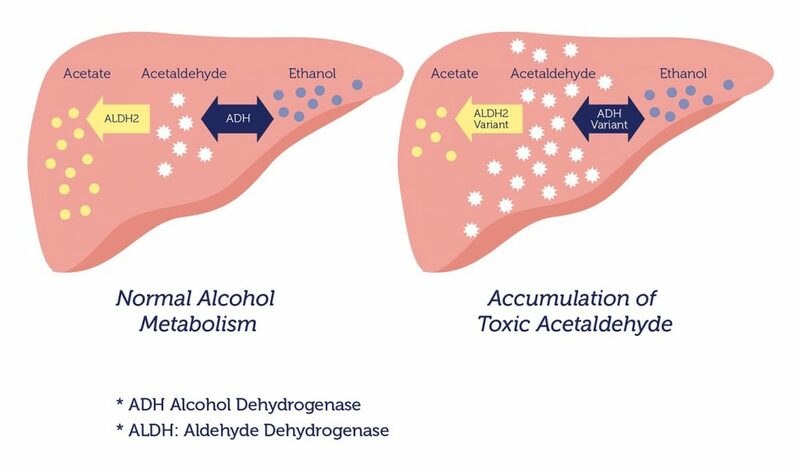 Those who inherit variants in two genes, ADH1B and ADH1C (that encode ADH enzymes), convert ethanol to acetaldehyde (first step of alcohol metabolism) at a faster rate. This increases the acetaldehyde levels before it can be cleared off by ALDH, in the second step of alcohol metabolism. On the other hand, a variation in the ALDH2 gene, makes an enzyme with reduced activity. So the second step of metabolism is slower than normal. However, the consequence is the same as before – an accumulation of toxic acetaldehyde. Symptoms of alcohol intolerance vary from person to person depending the genetic variants they inherit. For example, a person who inherits two ‘defective’ versions of the ADH1B gene will experience more severe symptoms, compared to someone with only one ‘defective’ copy. Since the symptoms are often not severe enough to stop them from drinking, those with only one ‘defective’ version are at higher risk for alcohol-related complications, like an increased risk of cancer and heart disease. The alcohol flush reaction, most commonly found in people of East Asian descent, is the result of inheriting the ALDH2 variant. While turning red or appearing intoxicated after just one drink may seem like a social faux pas, the flush response can signal risks associated with drinking. Studies show that if a person who experiences an alcohol flush reaction continues to drink, they increase their risk of esophageal cancer by 10-fold in the case of a moderate drinker or up to 90-fold for a heavy drinker. Alcohol ‘flushers’ who consume more than four drinks a week are also at higher risk for hypertension. Inheriting any of the genetic variants linked to alcohol intolerance also increase the risk for other cancers, cardiovascular issues and strokes. Increased acetaldehyde levels are not only responsible for the short-term symptoms like nausea and dizziness, but can also cause long-term damage to brain cells. 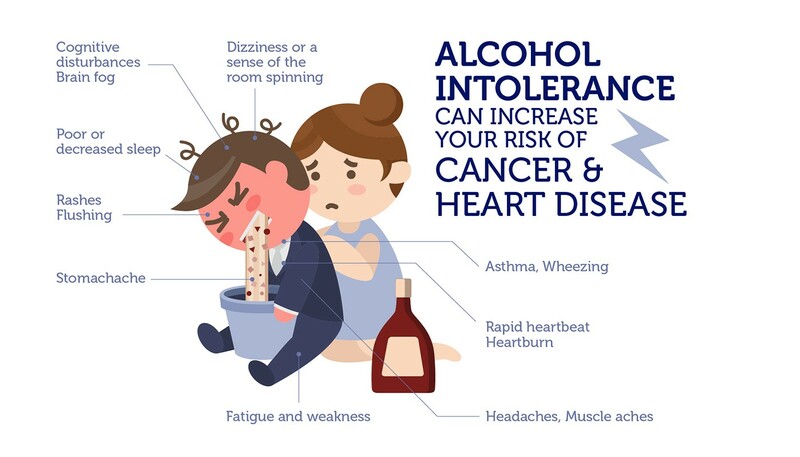 This means alcohol intolerance can lead to symptoms that typically associated with alcoholism, including memory loss, mental confusion, anxiety and depression. But, unlike with alcoholics, genetically susceptible people can suffer from these same complications, even if they consume very small quantities of alcohol. If you have always wondered why a drink or two makes you uncomfortable, experienced severe hangovers from just one glass of wine, or are a ‘flusher’, you may have alcohol intolerance. 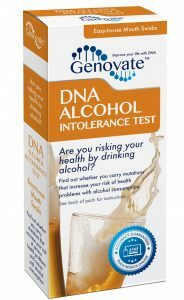 The DNA Alcohol Intolerance Test can provide you with the answer. But, how you let this information influence your social drinking is still entirely up to you. Previous articleDid you know DNA influences your fat processing and lipid levels? Next articleDid you know DNA influences your ability to burn fat for energy?